John has always been intrigued by the concept of “turducken” – a Cajun dish wherein a deboned chicken is stuffed inside a deboned duck, which is stuffed inside a deboned turkey, with layers of different stuffing between each bird, and the whole mess roasted for hours and hours. I’ve been unwilling to try it simply because it’s way too much food for the just two of us, and I didn’t want to experiment on dinner guests. Also, there’s something a bit revolting about the photos I found online of the creation – it looks like nothing so much as roasted roadkill. It occurred to me that one could probably do a more manageable version of this dish with breast halves, rather than the whole bird. Since Shlemiel the First closed Sunday and I have two months worth of down time before starting work on my next show, I figured now was as good a time as any to experiment. On MLK Day, John and I went to Wegman’s (my new favorite place), where I bought a half-breast of turkey, a package of boneless duck breast halves and a package of boneless chicken breast halves. 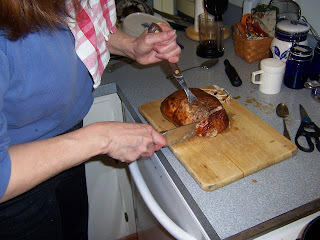 After lunch today I skinned and deboned the turkey breast half, then gave it a good beating with my new meat mallet (a Christmas gift from John – thank you, dear). I gave the same treatment to half a chicken breast and half a duck breast. I sweated some onions in butter, added some celery and some chopped apple and sauteed until soft, then combined the mixture with just a little Pepperidge Farm herb stuffing mix, crushed into crumbs. I added enough chicken broth to make it pretty soggy and adjusted the seasoning, adding a healthy shot of cayenne pepper as a nod to its Cajun roots. I laid out the turkey breast, covered it with a layer of stuffing, put the chicken breast on top of that and followed with another layer of stuffing, then put the duck breast on last with another layer of stuffing. I ran some cotton string underneath the whole thing and tied it off in the middle (just to keep it together), then stretched the reserved turkey breast skin over the whole thing, flipped it over and used a big curved upholstery needle and more of the cotton thread to stitch the skin in place. When I turned it back over, I had a neat little package of poultry and dressing, weighing about three pounds. I put it on a rack in a small roasting pan, brushed the skin with a tablespoon of melted butter and gave it a sprinkling of salt and pepper. There are no photos of this process because I really needed three hands and the two that are attached to me were a mess of meat, stuffing and cotton thread. The whole wrapping and stitching process was accompanied by a certain amount of cursing and much hand-washing, as it’s difficult to wield an upholstery needle when your hands are coated in poultry and stuffing. I used the remains of the turkey breast carcass to make a little stock. At 350 degrees, my Package of Bird took roughly an hour and a half to roast to an internal temp of 155 degrees. The skin was a beautiful rich brown when I took it out. I let it sit for about ten minutes while I made a little gravy/sauce with the pan drippings and stock and steamed some veggies. When I was ready to serve, I turned the whole thing over, removed the cotton string, turned it right side up again and sliced it. 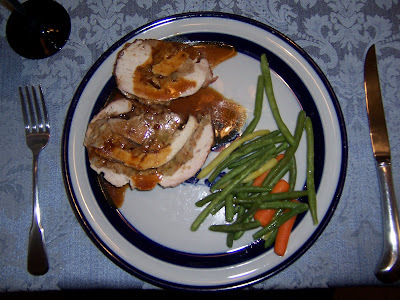 I have to say that it was a thing of beauty – more of a poultry roulade, perhaps, and maybe a bit more refined than the meatfest that is a true turducken. I was stunned at how moist and tender all the meats were – juicy and done to a turn. We didn’t even need to use a knife to cut it. In future, I would probably back off a little on the broth in the stuffing mix as it was a bit on the mushy side, but the flavor was insanely good, with a little sweetness from the apples and just enough kick from the cayenne. We had a little Chardonnay to go with it, but in retrospect a red wine might have been better – perhaps a pinot noir. Would I make it again? Probably – that is, if I can make myself forget about the stitching and cursing part. Maybe I’ll even get brave enough to serve it to company. And maybe – just maybe – I might try it one day with whole birds. Yeah – when I grow that third hand. Thanks – now I’m going to have that image in my head for DAYS. January 30, 2008 - 3:32 pm Joan L.